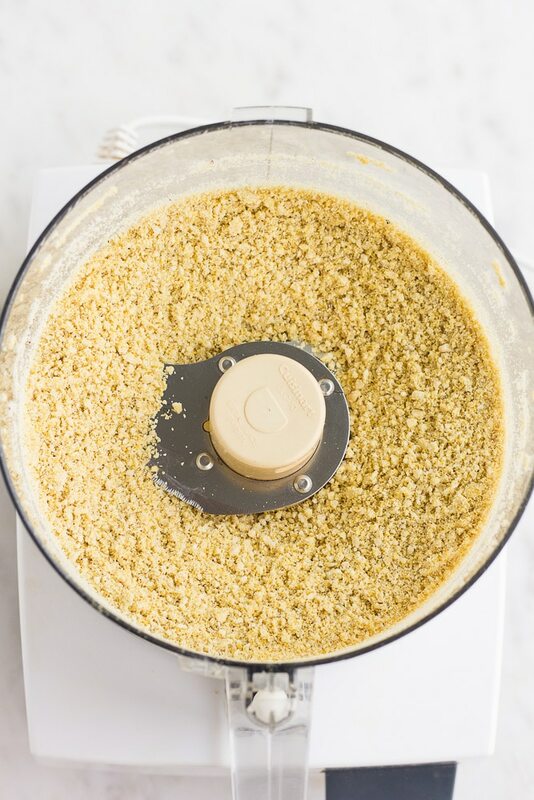 Vegan Parmesan Cheese is a staple you’re going to want to keep in your fridge and sprinkle on everything! 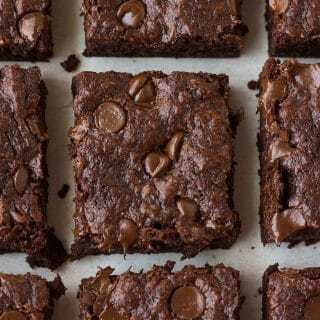 3 ways to make it with a nut free option. 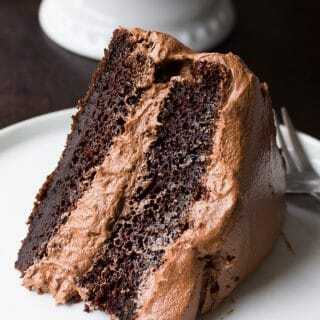 Ridiculously easy and only 3 ingredients! 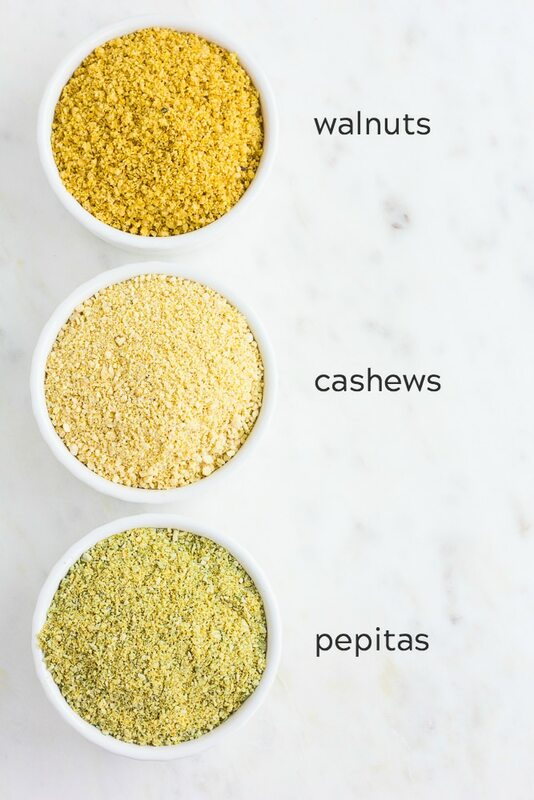 This is my version of Vegan Parmesan Cheese, with options for slightly different flavors and allergy needs. I love to sprinkle this stuff on everything! 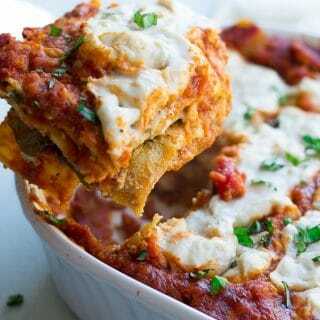 Try it on pizza, vegan baked ziti, spaghetti and meatballs, lasagna, caesar salad, mac and cheese, tofu scramble, spinach artichoke dip and more. 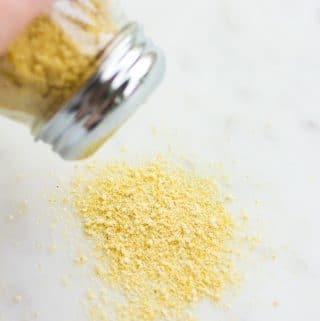 Vegan Parmesan keeps for weeks in the refrigerator. Make a double batch so you can instantly add flavor to many dishes whenever you want. Let’s make some cheese! 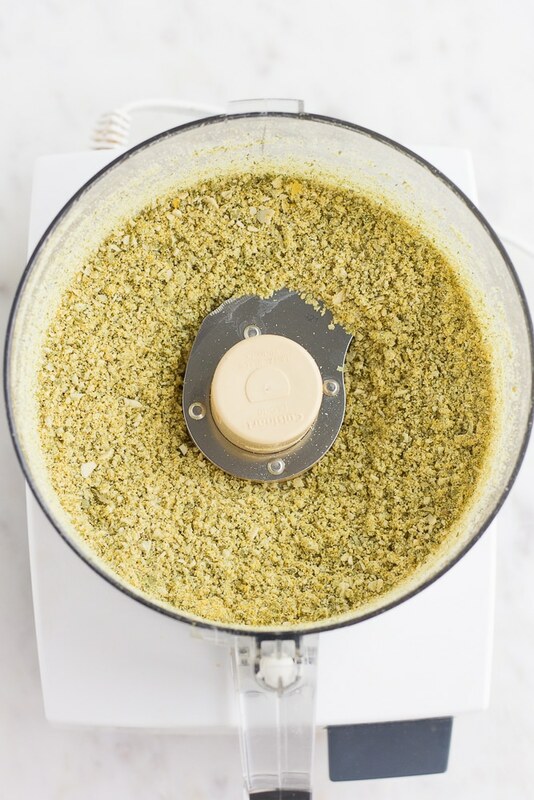 This version is so delicious on a kale salad, or anywhere else you would use parmesan cheese. For a similar taste, you can use raw pecans instead of walnuts. Pecans or walnuts are especially tasty for a holiday salad, such as this Festive Kale Salad. 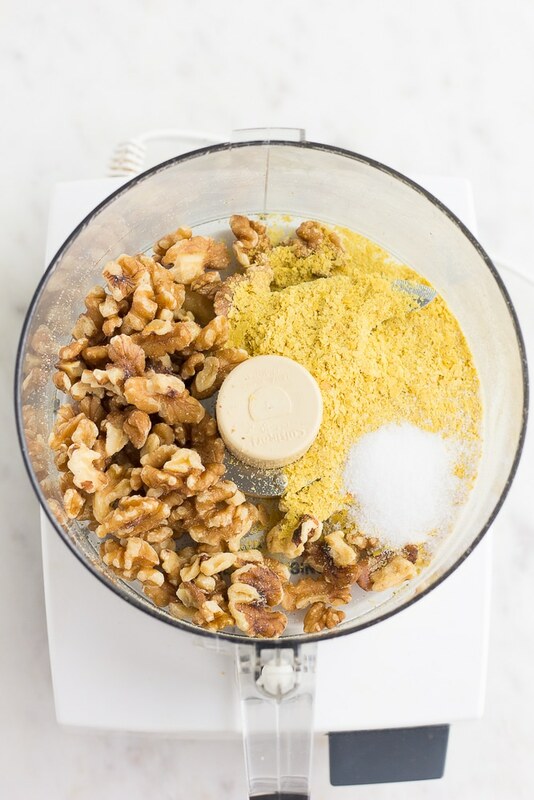 Add 1 cup of raw walnuts (important: they must be raw), 1/3 cup nutritional yeast and 1 teaspoon salt to a food processor and pulse until crumbly. Cashew Vegan Parmesan is by far my favorite version. It has more of a “cheesy” taste than the other kinds, and it tastes great everywhere! Cashew parmesan is the best “every day” cheese, and is perfect on pizza and pasta dishes. 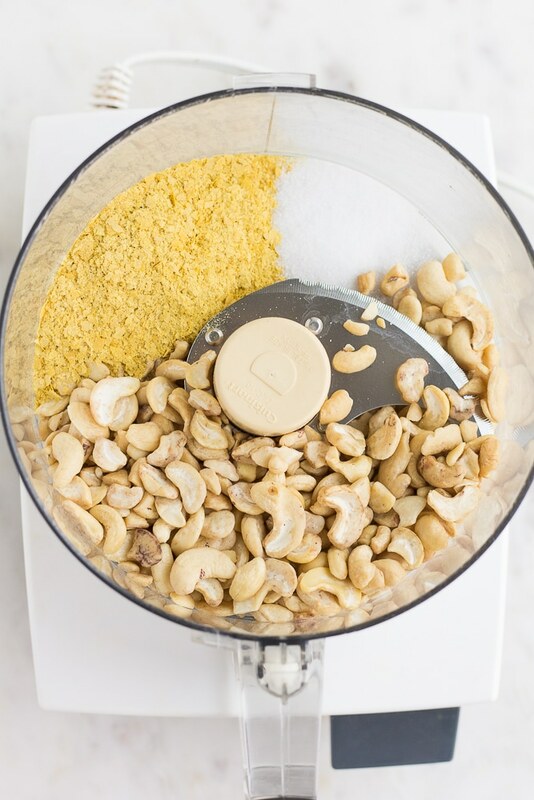 For this version, add 1 cup of raw cashews (may use whole cashews or pieces), 1/3 cup nutritional yeast and 1 teaspoon salt to a food processor and pulse until crumbly. Find a discount store with a good bulk section to find the best deals on nuts and seeds. If you are on a budget, don’t buy your nuts/seeds at Whole Foods unless you want to throw your money away! Even in bulk, they are SO expensive there. Trader Joe’s also has great deals on nuts/seeds if you have one near you. 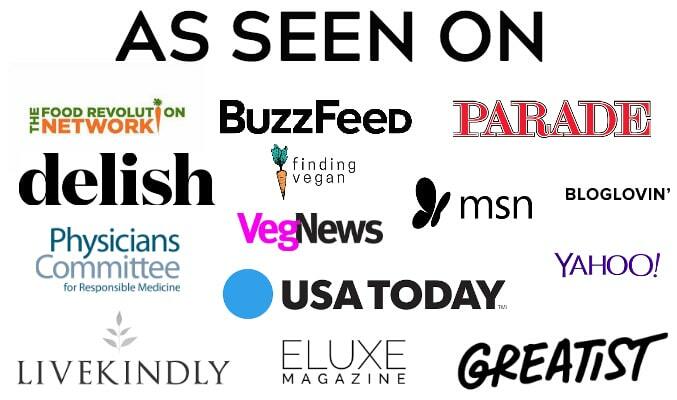 I was surprised at how tasty pepita vegan parmesan turned out! So if you can’t have tree nuts, but you can have seeds, I highly recommend trying this version. You could also sub raw sunflower seeds, or even hemp seeds if needed. 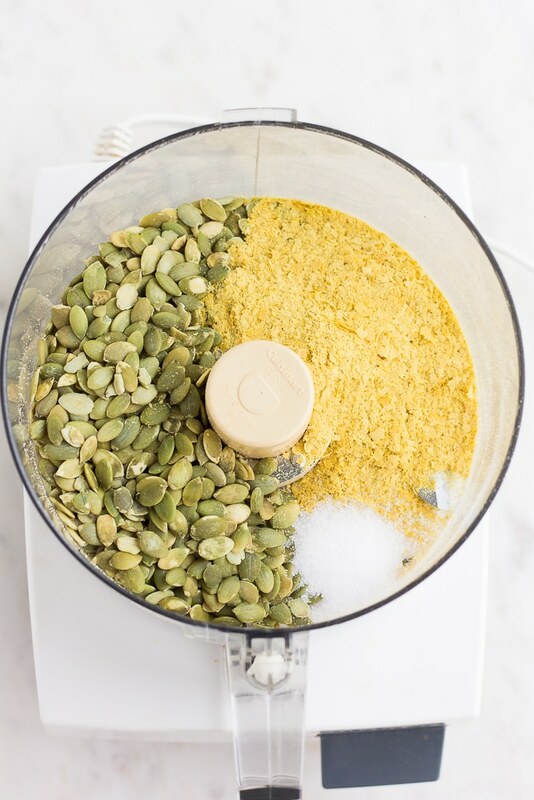 Add 1 cup pepitas, 1/3 cup nutritional yeast and 1 teaspoon salt to a food processor and pulse until crumbly. 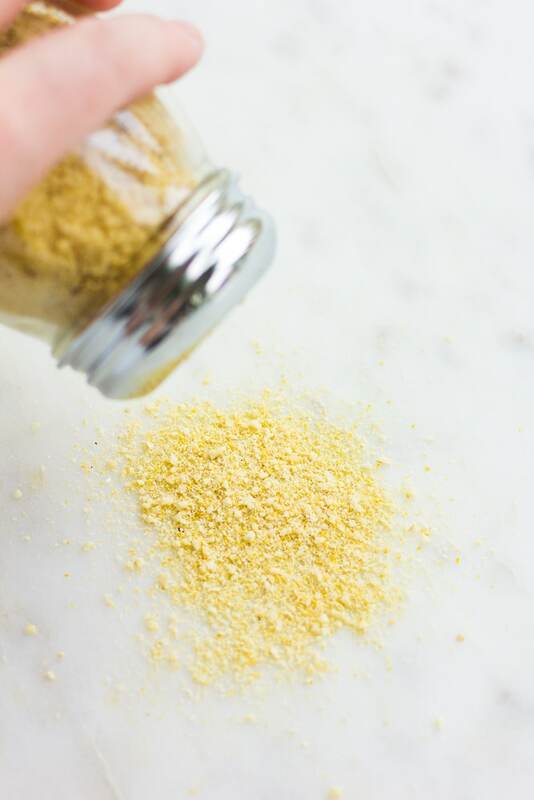 Vegan Parmesan Cheese is a staple you're going to want to keep in your fridge and sprinkle on everything! 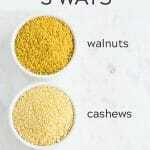 3 ways to make it with a nut free option. Ridiculously easy! 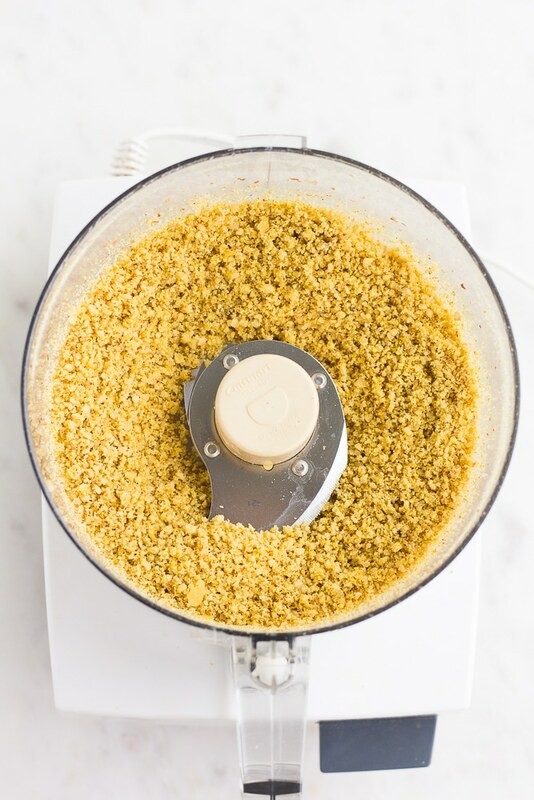 Add all ingredients to a food processor, and pulse until a crumbly consistency is reached. Don't pulse for too long or it will turn into a paste. Store vegan parmesan cheese in the refrigerator for several weeks; it lasts quite a long time. Use it on pizza, pasta, tofu scramble, roasted vegetables and anywhere else you like. This also works with raw slivered almonds, sunflower seeds or even hemp seeds. Or try a mixture of nuts/seeds. Calories are an estimate only for about 1 tablespoon parmesan cheese. For even more flavor, you can add 1/2 teaspoon garlic powder.